(Newser) – The hotel security guard injured by Las Vegas gunman Stephen Paddock was shot before the mass shooter began massacring the festival crowd below the Mandalay Bay Hotel and Resort, police said Monday, making a major change to their timeline of the shooting. 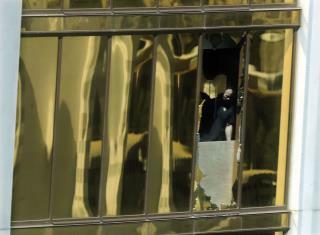 Clark County Sheriff Joe Lombardo, who previously said the arrival of security guard Jesus Campos may have caused Paddock to stop firing on the festival audience, now says Campos was investigating a report of an open door on the 32nd floor when he heard drilling sounds coming from Paddock's room, the AP reports. The sheriff says Paddock had installed hidden cameras and started firing into the hallway when he saw Campos approaching. Heck this guy was a WHALE, so the casino is not too anxious to show security footage, which I'm sure shows footage of the bellhops helping load all those (gun)suit cases up to his room. Boy, it looks like the casinos picked the wrong person to mess with, I could be wrong.